Who cares for the carers? That’s the question at the heart of Grace Under Pressure, a verbatim theatre work devised by writer-director David Williams and University of Sydney’s Paul Dwyer in collaboration with the Sydney Arts and Health Collective. After interviews with dozens of professionals across the industry – mostly doctors and nurses at various career stages – they have woven together a series of stories and recollections that highlight the untenable work conditions, extreme levels of stress, and culture of humiliation that pervades the strictly hierarchal hospital environment. This is theatre with purpose; this is theatre to spread awareness. 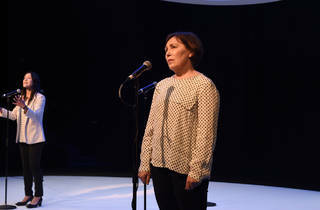 In this premiere production, directed with sensitivity and gentle pacing by Williams, the stories are shared among an ensemble of four actors: Renee Lim (who is also a practicing doctor in palliative care and accident and emergency), Rose Maher, Sal Sharah, and Wendy Strehlow (who played a nurse for several years on local soap A Country Practice). On a bare stage (by Isabel Hudson) ringed by microphones and lit by Richard Manner to resemble the shape of a pill, the actors move from mic to mic to adopt new characters (there are 18 in all) and tell new stories. It has the effect of pleasant shape-shifting; it’s never jarring, and each new character and anecdote is clearly delineated from the one that came before. It can be difficult to hear what our care workers – who we want to believe are infallible, or at least more capable than the rest of us – work within and suffer through. The script, which is deceptively chatty and self-effacing, tackles the dangerous levels of fatigue, extreme overwork and underpayment, sexual harassment, trauma and constant belittling from superiors that is endemic to our hospital system. The interviewees are anonymous – Williams and Dwyer have built some requests to be anonymous into the script – because they address specific medical professionals’ fraught mental health (which could cost them their jobs) and other sensitive information, like suicidal ideation and specific examples of bullying or harassment. We hear about doctors who don’t have time to eat. Who are so sleep-deprived they cause serious car accidents. Who, if they had more assistance and better hours, could have kept more people alive. Who left the industry because it would have killed them. Who are bullied and turn into bullies themselves despite their best efforts. It’s an industry, we soon begin to realise, in dire need of reform. 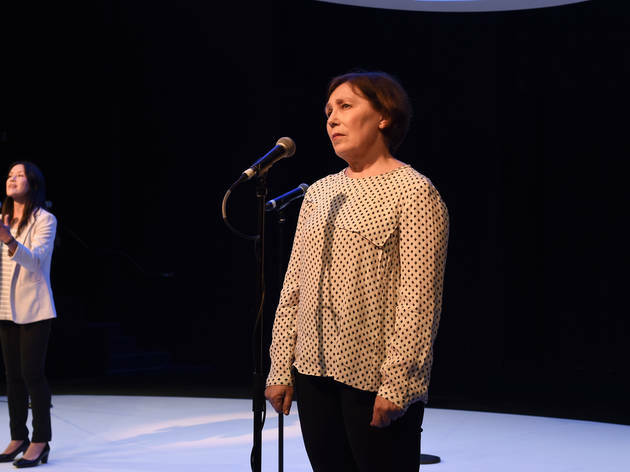 More a talk than a play, Grace Under Pressure avoids theatrics in order to put focus on the words, delivered with compassion via the humanising, direct-address performances of the ensemble. At 95 minutes, this no-frills style can feel static, and its structure and lack of conventional plot can challenge an audience’s expectations and behaviours: on opening night, several audience members pulled out their phones without covert glances or attempts to hide the glare as they checked facebook, or murmured to their friends. While each story was important and compelling in its own right, the switching of microphones and actors can start to feel repetitive, desensitising audiences to the content. Still, there’s a disarming quality to Grace Under Pressure. It’s like you’re being let in on a terrible secret – and one that probably necessitates action on your part. Maybe it’s remembering that your medical professionals are trying their best to care for you. Maybe it’s lobbying for change. Maybe it’s giving the nurse or doctor or carer in your life a hug and a cup of tea. They’ve more than earned it.